Dropshare is your very own secure file-sharing tool. 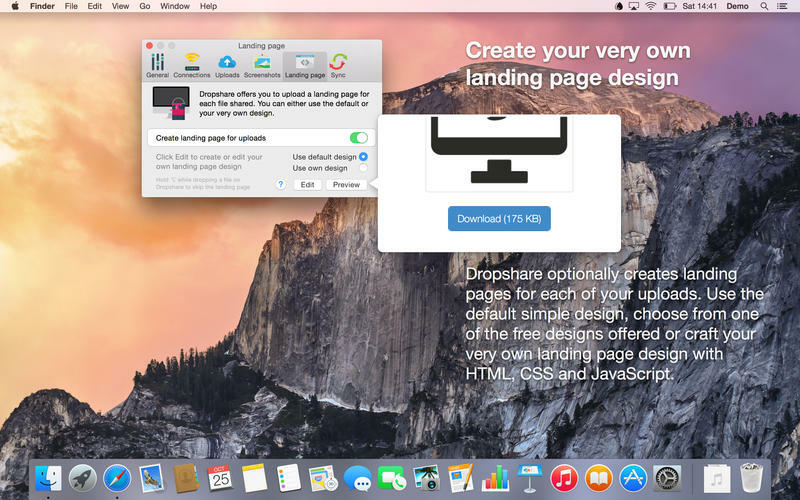 Dropshare is a menu bar application for drag-and-drop upload files, screenshots and even directories to your own server, Amazon S3 or Rackspace Cloud Files. Sharing files with friends, customers, colleagues or anyone else has never been so professional! Dropshare is a secure alternative to cloud hosted file sharing. Instead of sharing your files via a cloud hosted service with no control and monthly financial commitments, just use your own server: Dropshare natively supports Secure Copy (SCP over SSH), a secure industry standard protocol for file transfers. Additionally – in case you don’t have an own server or SSH account at your disposal – Dropshare supports uploads to Amazon Simple Storage Service (S3) or Rackspace Cloud Files, which both are low-priced file hosting services in the cloud. Compared to other cloud hosted file sharing services, Dropshare directly connects to your very own Amazon S3 bucket or Rackspace Cloud Files container, so there is no third-party involved at all. Dropshare supports Multiple Connections: You can set up different upload destinations at the same time and switch between them using user-defined keyboard shortcuts! Uploads everything: No matter if files, folders, text or screenshots – Dropshare uploads every file and data to your selected destination – also from clipboard or other applications like Safari. Automatic screenshot upload: Screenshots can be optionally uploaded automatically. Sharing them has never been so easy – just take a screenshot, wait a second for Dropshare to upload it, and there you go! Choose your URL shortener: Dropshare supports URL shorteners as well – choose from a variety of natively supported URLS (e.g., goo.gl or dsh.re), or configure your very own URL shortener service like bit.ly (for hosted services) or YOURLS (for self-hosted services). 1-Click: Delete from your server Whenever you decide that you no longer want to share a specific file, just use Dropshare to delete it from the upload destination again. Never forget your uploads: A full history of all your uploads is available, and it enables you to either copy the sharing URL to your clipboard again or delete the file. Markdown to HTML: If enabled, Dropshare automatically converts Markdown files to HTML. 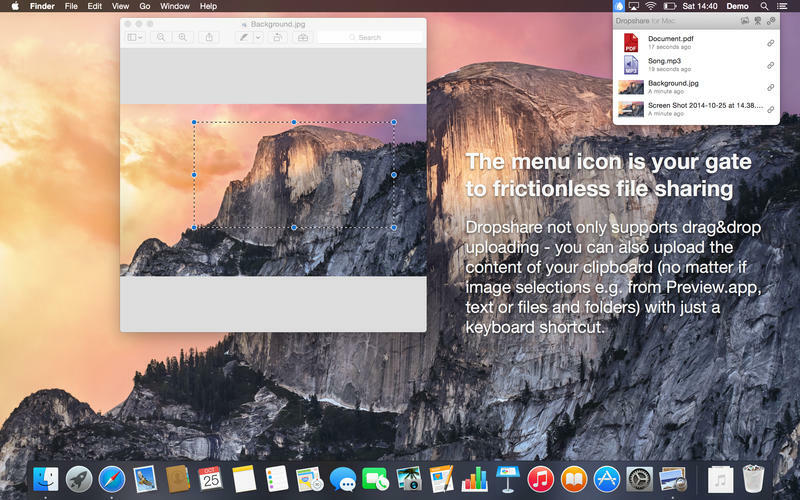 Services enabled: Dropshare introduces itself to the Mac OS X Services Menu. By doing so, you can perfectly use the tools Mac OS X provides to create, for example, keyboard shortcuts for specific actions. Secure Copy (SCP over SSH) to your own server: Dropshare supports SCP over SSH natively. A working SSH user account is required on the server. A password (for keyboard-interactive authentication) or a SSH key pair (for public key authentication) is also required. Please note that both the public and private key needs to be set up. To have the uploaded file displayed in a web browser, a web server needs to be installed and configured on the server.